For dancing in the street"
Nasty Gal Dress // Michael Kors Wedges // Clare V Leopard Clutch // Kendra Scott Earrings // Kendra Scott Ring // Ray-Ban Sunglasses // Love's Affect White Bracelet ℅ // Stella & Dot Spike Bracelet // Moon & Lola Pineapple Charm ℅ // NARS Lipstick in "Heat Wave"
After a really fun weekend I figured it was only fitting to post a really fun outfit!! 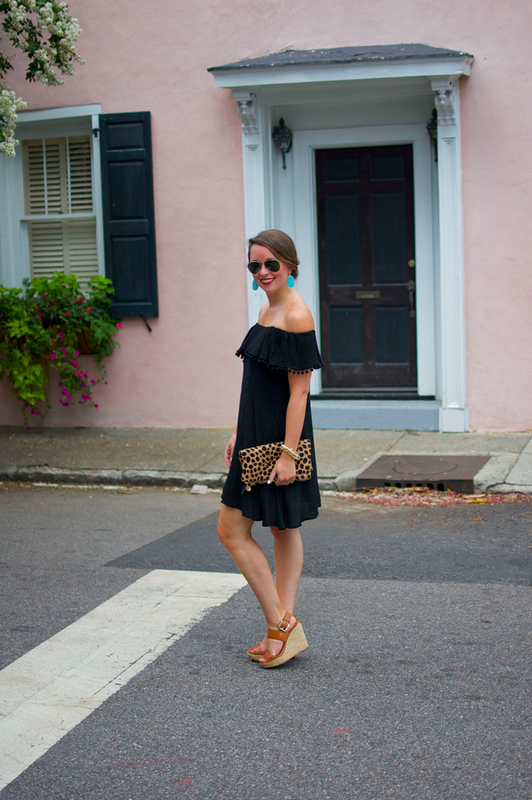 I adored wearing this dress in Charleston and it was perfect for the heat because it breathed so well. It also was pretty loose and caught the breeze really easily. Even though it was black I was comfortable walking around and exploring Chucktown before dinner with friends! 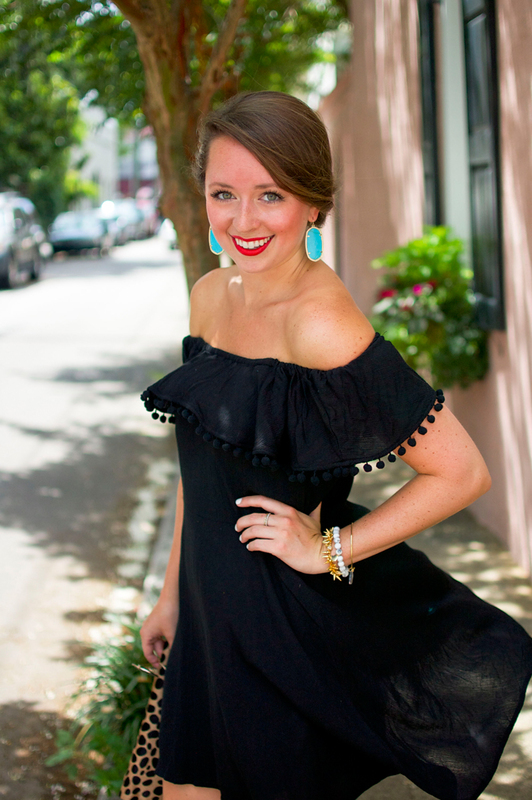 The little pom-pom details are such a precious touch and it was the perfect opportunity to throw on some bright accessories and my favorite lippie… I love it paired with turquoise! Stay tuned on Instagram and Snapchat (jennrog3) today because I have a super exciting announcement for you DC/VA area ladies!! EEK! I'll do a full recap in tomorrow's blog post! ;) Any guesses as to what it is?? It has to do with something pretty in this post! I remember that song! 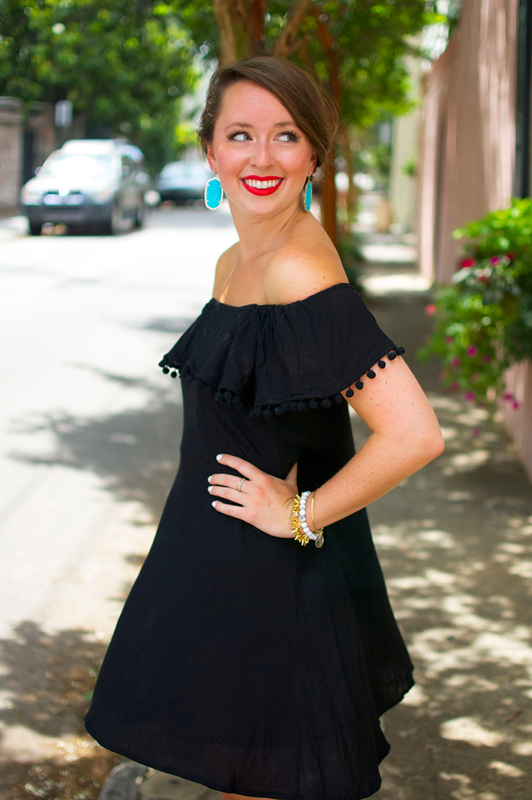 I love the off the shoulder and tassels on your dress! 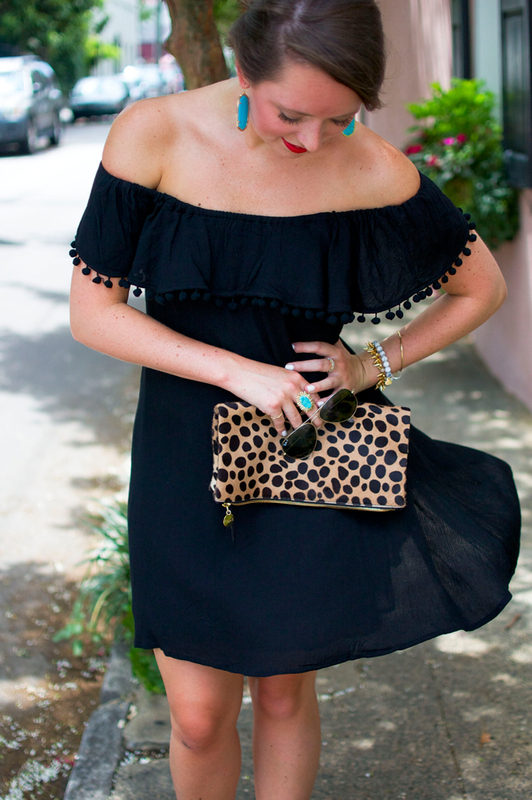 That leopard clutch is so fun with it! LOVE this dress on you!!! Cutest!! This is GORGEOUS, Jennifer! You are so beautiful! Such a fabulous and fun dress! I'm so happy we got to meet at SBScon! You're a gorgeous gal. Gimme that clutch!